We complete more than 1000 Oral Cancer Screenings every month. All patients have an Oral Cancer Screening as part of every full dental examination. The examination includes a dental healthy history to look at risk factors, plus and examination of all the soft tissue and underlying mouth structure. There is a particular emphasis on the Tongue and floor of the mouth, any swellings or tissue blemishes (ulcers/white patches). We also look at Family History. All our dentists are fully trained to carry out complete Oral and tongue Cancer Screening. This is part of every Examination carried out at the practice. We operate a very well tried and tested 14 Day referral System. Mouth cancer can affect any part of the mouth, including the tongue and lips. The most common symptoms are having a sore or ulcer for more than three weeks. 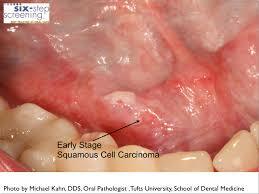 Mouth cancer is also sometimes called oral cancer. 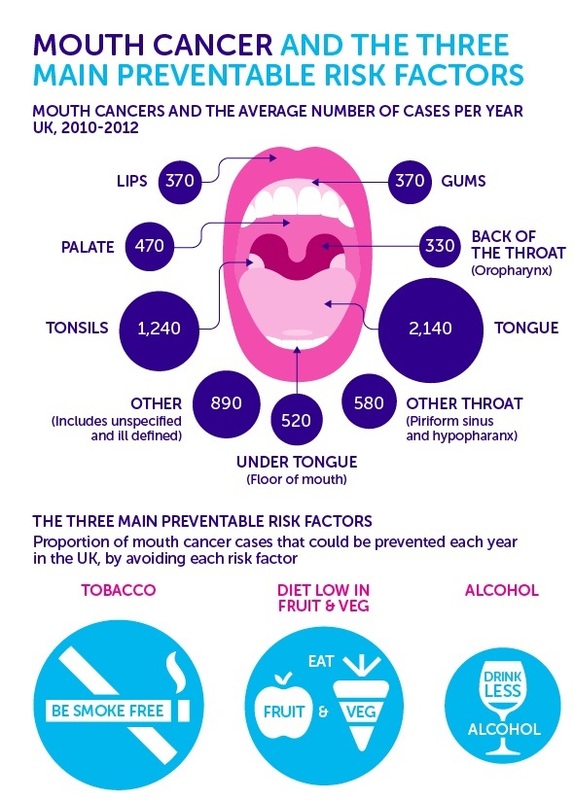 Although mouth cancer is uncommon in the UK, it seems to be getting more common. There are around 4,700 cases that are diagnosed each year. It is twice as common in men as it is in women and is rare in people aged under 40. Many cases are diagnosed by dentists rather than doctors. •Smoking. 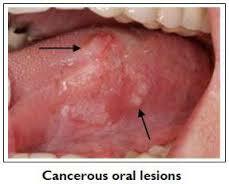 Mouth cancer is just one cancer which has a much higher incidence in smokers than in non-smokers. •Alcohol. Drinking a lot of alcohol can increase your risk of developing mouth cancer. •Chewing tobacco or the betal leaf. •The human papillomavirus (HPV) may increase your risk of mouth cancer. •There are some conditions affecting the mouth, such as leukoplakia and erythroplakia, which can increase the risk of a cancer developing. Mouth cancer is not hereditary, so does not run in families. The most common symptoms of mouth cancer are a sore or ulcer in the mouth that does not heal, and pain in the mouth that does not go away. •White patches anywhere in your mouth (leukoplakia). •Red patches anywhere in your mouth (erythroplakia). •A lump on the lip, tongue or in the mouth or throat. •Unusual bleeding or numbness in the mouth. •Pain when chewing or swallowing. •A feeling that something is caught in the throat. •Loose teeth or dentures feeling uncomfortable and not fitting properly. •A change in your voice or speech problems. •A lump in the neck. •If the cancer spreads to other parts of the body, various other symptoms can develop. Note: any ulcer in the mouth that does not heal after three weeks should be checked by your dentist or doctor.